I am so stinking excited to share my latest idea to make another small, high basement window look big and beautiful! I'm absolutely thrilled to finally share this how-to! 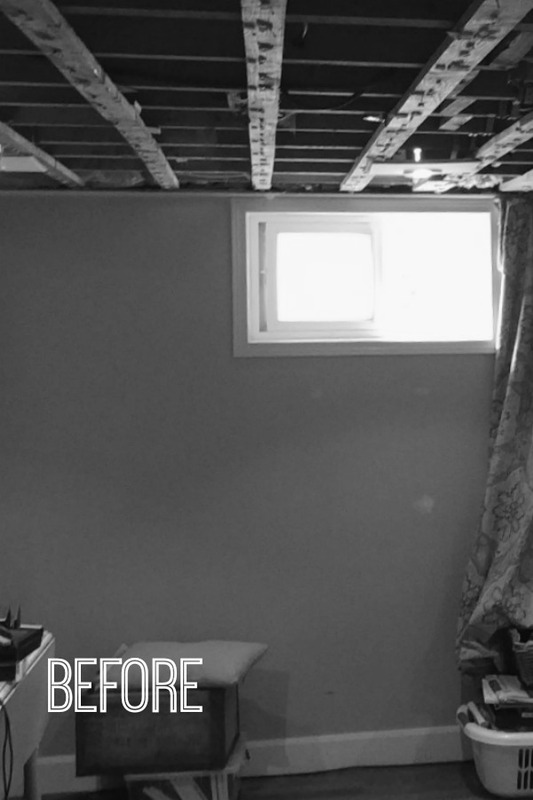 Have you seen our earlier basement window solution from our guest room? It feels like a main floor room now. I LOVE that one, too, don't get me wrong. But that idea popped spontaneously into my head one day - so that love is surprising and healthy. This new window love is a long slow burning obsession finally realized. 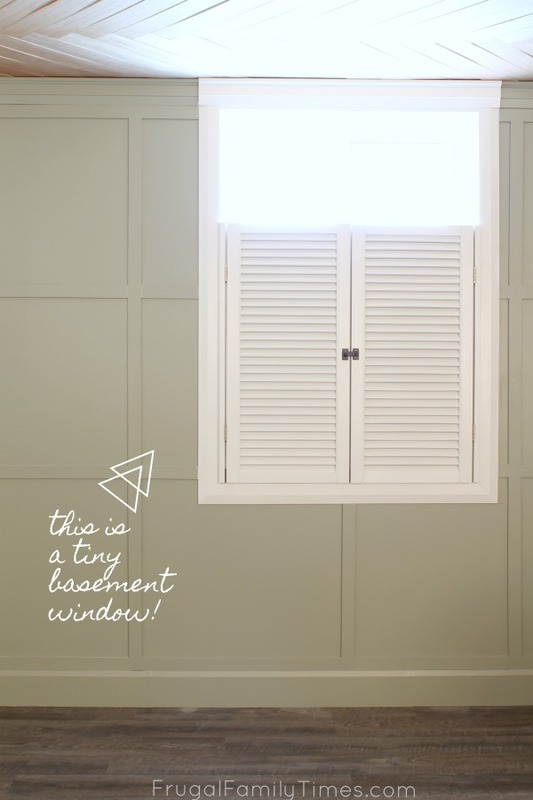 If you've got one of these tiny, high basement windows, you likely know what a dilemma they cause - they just scream BASEMENT. They won't let you forget, no matter how thoughtful the rest of your room looks, that this an afterthought sort of space. No longer! I have had this shutter idea for so long - one thing, in particular, held me back from executing it. You know, that age-old problem: money. I had priced out new shutters for this project. They were going to need to be custom to fit properly - for a price tag of about $350+. On the low end! That felt much too steep for a faux window that may or may not solve my basement window problem. I couldn't justify it. My next route was trolling the online market sites, for our area that meant Kijiji and Facebook Marketplace. I found some here and there - but few were even close to the right size and most were made of vinyl. 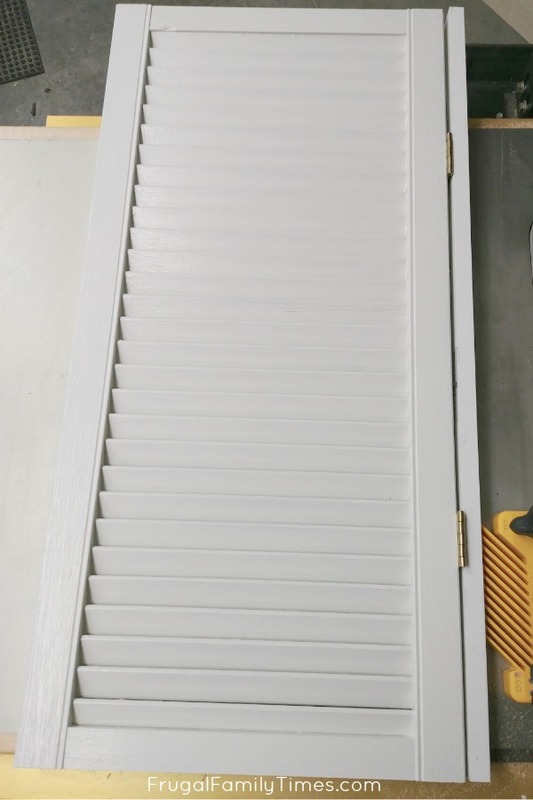 Vinyl shutters would have been hard to cut and tricky to paint. Not ideal by a long shot. Then I was roaming around our local ReStore. And spotted a potential solution. And the solution was only $15! Old bifold doors! I didn't know I always wanted them! Like a dummy, I didn't buy them right away. This girl needs to get some confidence. A couple days later I dragged Ed to the ReStore and presented the idea to him. He was game - which is usually true - and a little peeved with me that I didn't just buy them the first time. I am so thankful they were still there. The width was just about perfect for our window. Privacy window film - makes basement windows translucent and glow vs. show weeds or the car parked right there - dead giveaways that you're underground. MDF or another material to build up any gaps that need it - we attached our hinges to this. 1/4" MDF panels to block the light behind the shutters. The first thing we did was cut both sides of the bi-fold in half. This left us with a tall and shorter pair of shutters. After holding both in place we decided the shorter half was the best proportion. I sanded the rough cut edges of the doors. I used wood-fill to hide any of the extra holes and sanded them smooth. Then I wiped it all down with a damp cloth. It was ready for a coat of primer and two coats of paint. We knew we needed to add a bit to the width - the shutters were about 2" narrower than my window. Ed cut a 1" piece of MDF for each side. 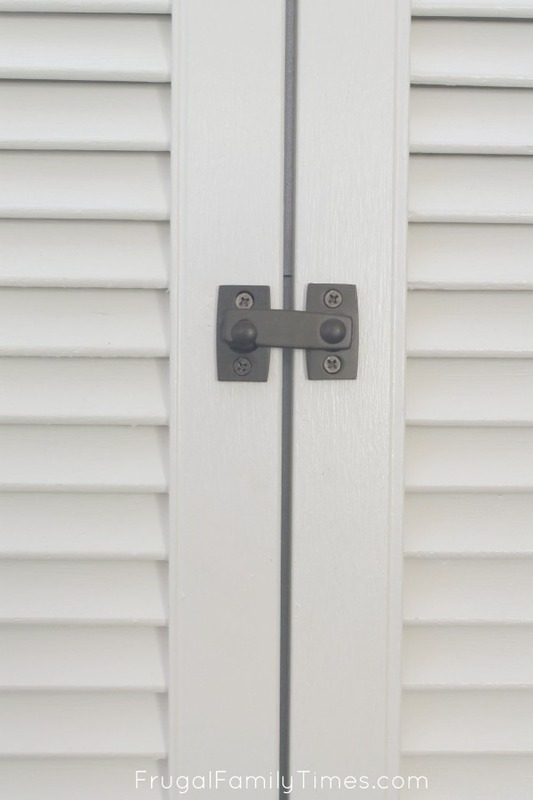 The pieces were the same length and depth as the shutters. I held the shutters in place so that they were exactly the height I wanted them - basically covering the bottom frame of the real window. Ed fastened a temporary cleat to the wall. We rested the shutters on this to make sure they were level - they are too heavy to hold precisely by hand. We then attached these hinge-filler pieces to the wall. Nails are not sufficient to hold this weight well - so after it was held in place we put two screws on each side as well. The next step was to frame around the window and shutters. We actually flipped our window casing trim so that the widest part runs along the shutters. This was to minimize the visual difference in the depth of the shutters. 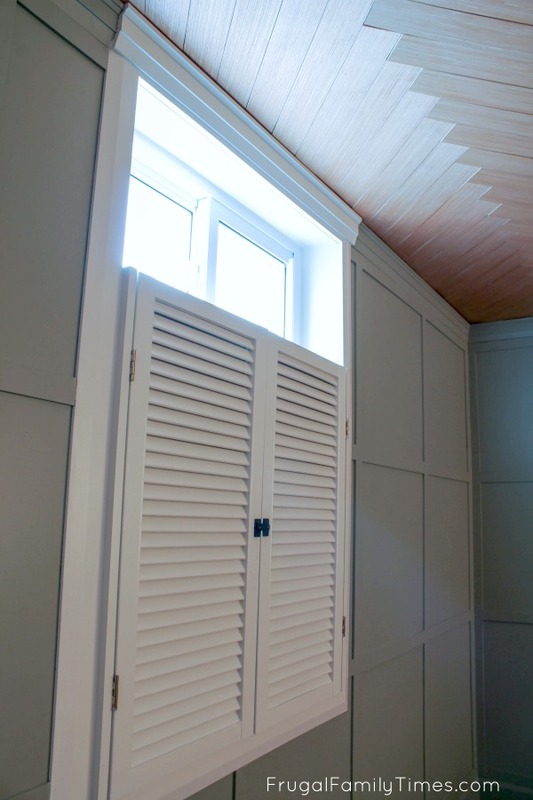 In the rest of the rooms, the trim is installed the other way - you can't really notice that they're different from each other - but you would notice that the shutters were way deeper than the thinner part of the trim. You need something to block the light from coming through the top of the shutters - where they overlap the window. If you don't block the light there it will scream fake window and the jig is up. We used 1/4" MDF panels. We tried to paint them with glossy mirror-like spray paint - as you can see it didn't work - it's just flat gray. Turns out the gloss wouldn't have mattered, but I thought a mirror would have been ideal to throw some sparkle through the slats. Mirror would have been $$$ - and really not worth the expense. We then attached this lovely little hinge to make it all look legit. Funny story: we had originally nailed it all shut. There's no reason for the shutters to open, so why make them operable? Well, every single person who has ever come and looked at this window compulsively HAS to open it. They can't NOT open it. We decided that we needed to make them operate or else some friend of the kids' was going to pull them off the wall trying to open them. Isn't she pretty?! The large window effect is even more convincing in person. I couldn't be happier - it's one of those times a project turns out even better than you expected. It's going to take us some time to get all these projects finished, photographed and posted - I can't wait!!! In the meantime, have you seen our other Basement Makeover Projects? 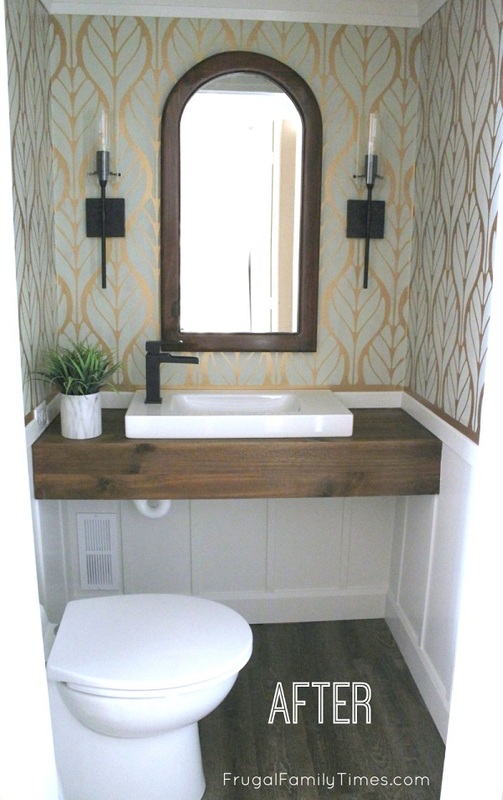 We turned a closet into a basement bathroom & made the coziest guest room that doesn't feel like it's underground. Don't miss a thing - scroll up to the top and subscribe to our weekly-ish newsletter for updates and sneak peeks. Love it, perfect idea... Very creative!! !